Richard I. Bong grew up with Swedish parents on a farm in Poplar, Wisconsin as one of nine children. He became interested in aircraft at an early age, and was a keen model builder. 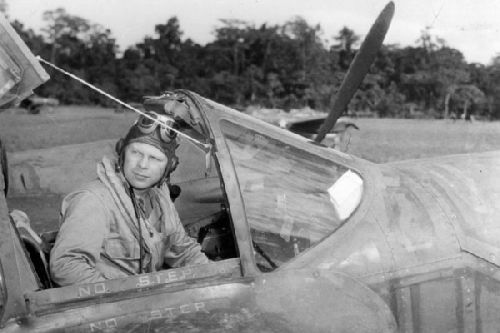 He began studying at Superior State Teachers College in 1938 and in 1941, Bong enlisted in the Army Air Corps Aviation Cadet Program. By January 1942 was made gunnery instructor. He was first assigned to the 49th Fighter Squadron, 14th Fighter Group where he transitioned to the P-38 Lightning aircraft. During the course of his military service as a fighter pilot, Bong is credited with 40 kills and is nicknamed "Ace of Aces". 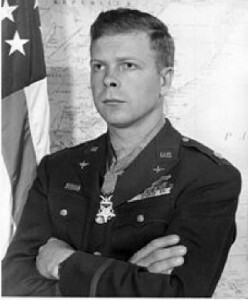 He was awarded numerous distinguished awards including Medal of Honor, Distinguished Service Cross, Silver Star, Distinguished Flying Cross and Air Medal. He died on August 6, 1945 near Burbank, California while performing as a test pilot. 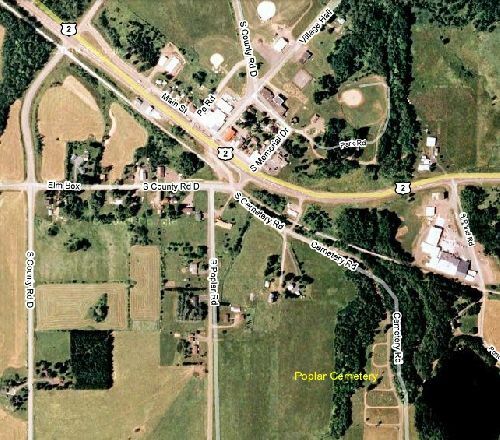 He is buried in Poplar, Wisconsin Cemetery (see below).